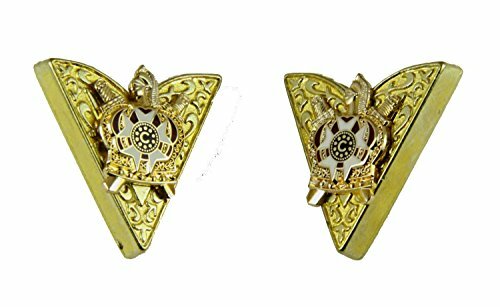 This is a set of 2 collar tips, finished in a polished gold tone, each with an Order of DeMolay emblem attached. Each has a small thumb screw on the back to fasten them securely to your collar. We also have matching cufflinks and button covers, item numbers 4031782 and 4031783. Comes in a nice gift box. If you have any questions about this product by Shrine & Mason Products, contact us by completing and submitting the form below. If you are looking for a specif part number, please include it with your message.